AMM-Blessed Oil - Request Yours Today! 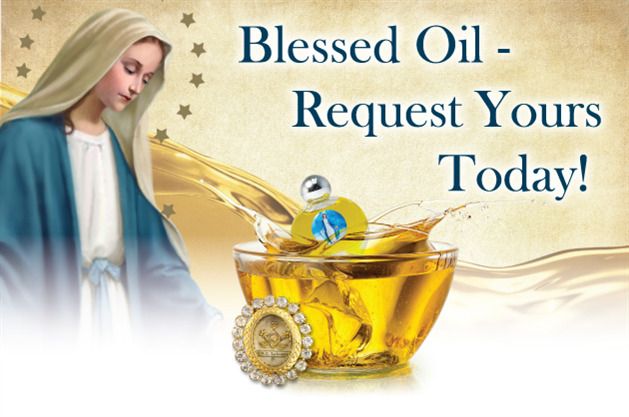 Blog Home > Category > What's New > Blessed Oil - Request Yours Today! Enduring life’s many trials and tribulations can feel so very overwhelming. Worries over finances, physical illness, work stress, family struggles, and more, threaten our faith and steal our joy. Use our Blessed Oil as a reminder to turn your thoughts and prayers to Jesus and Mary. For an offering of $17 or more, we will send you a hand-packaged, half ounce bottle of oil which has been blessed here at the National Shrine of Our Lady of the Miraculous Medal and touched to a first-class relic of Saint Catherine Labouré. Say this prayer to our Lady when using this oil on yourself, your children, grandchildren, and anyone else in need of Mary’s motherly care and God’s healing love. Read Fr. Kevin’s letter about the Blessed Oil and turning to God.